By now you’ve heard a lot of noise about the Great American Solar Eclipse that will happen on August 21st. Chirpy newscasters across the country have modeled the ever-so-stylish eclipse-protection eyewear, and travel sites are promoting remote cabins in the wilderness from which to achieve the best view of the celestial event. There’s a lot of hype surrounding this astronomic occurrence, but really, what’s the big deal? Why is this eclipse so significant? This is the first total eclipse that will move across the entire United States since June of 1918. Eclipse chasers, known as umbraphiles (roughly translated as “lover of shadows”) have been waiting 99 years for this event. There have been plenty of partial eclipses within the last century, but this is the first total solar eclipse to cross our nation during that time. Ironically, umbraphiles won’t have long to wait for the next total eclipse, which is predicted for April 8, 2024 – only 7 years in the future. That event will be known as the Great North American Eclipse, as it will touch Mexico, the United States, and Canada. The eclipse will cross fourteen states for a few minutes each, beginning with first contact in Lincoln Beach, Oregon at 9:05 am PDT. Oregonians in the path of totality (a relatively thin ribbon only 70 miles wide) will experience totality beginning at 10:16 am. During the next 90 minutes, the path of totality will move from west to east through Oregon, Idaho, Wyoming, Montana, Nebraska, Iowa, Kansas, Missouri, Illinois, Kentucky, Tennessee, Georgia, North Carolina, and finally South Carolina, where it will end near the city of Charleston, at 2:48 pm EDT. Shadow effects will still be seen until 4:09 pm EDT, when the eclipse leaves the United States. The longest duration of totality will occur near Carbondale, Illinois, where the sun will be completely covered for approximately two minutes and forty seconds. 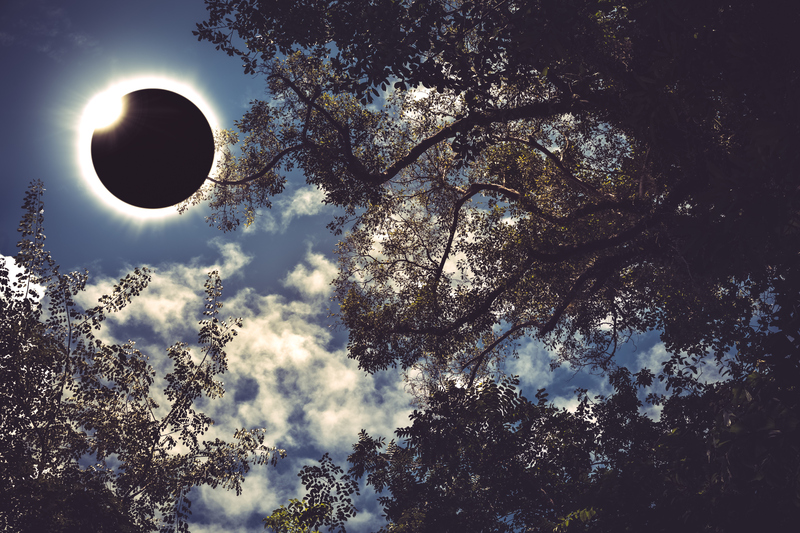 The term “total eclipse” is used to describe the position of the moon as it passes between the earth and the sun, blocking all of the sun’s light. As a result of the moon’s orbit around the earth and the earth’s rotation, the total eclipse “moves” across the surface of our planet. The area of darkness created by the moon’s shadow is known as the umbra, and the areas surrounding it, where the sun is only partially blocked by the moon, are known as the penumbra. During this eclipse, most of North America will be in the penumbra zone. The sun passes through several stages on its way to total coverage. It begins with a partial eclipse as the moon starts to block the sun’s disk. This causes the sun to appear as a crescent in the sky. Shortly before totality, the sun’s light unifies into one bright spot, known as the diamond. As the last of the sun disk shines along the edge of the moon, it forms a ring of light – the diamond ring. This gives way almost immediately to a phenomenon known as “Bailey’s Beads” – when sunlight shines through low-lying valleys on the edge of the moon, forming a string of “beads”. The beads vanish as the two orbs achieve totality, which may only last for one minute in some places. After that, a crescent will begin to form on the opposite side from where the diamond appeared, as the sun emerges from behind the moon. The astronomical acrobatics of a total eclipse are fascinating to watch, but the watchword here is SAFETY. It is never advisable to look directly at the sun without eye protection, since there is a strong probability of serious ocular damage. According to NASA experts, regular sunglasses are not adequate to protect your vision from damage while watching an eclipse. Fortunately, there are quite a number of ways you can observe the eclipse without compromising your eyesight. Locating a pair of ISO 12312-2 compliant glasses should not be a problem. Most are inexpensive, disposable, and sold at neighborhood retailers or available through schools or local astronomy clubs. NASA offers several options for safely viewing the total eclipse, including tutorials for building your own projection viewer, creating a white light filter, or simply downloading their live streaming app. You can investigate further here: https://eclipse2017.nasa.gov/eclipse-101. There are a number of apps available for both Apple and Android devices for viewing the eclipse – and the best ones are free! Check out Eclipse Safari, the Smithsonian Eclipse 2017, and of course, NASA Globe Observer. Space.com provides some good recommendations: https://www.space.com/37568-best-total-solar-eclipse-apps.html. Wherever you are in the United States on August 21 you will be exposed to at least a partial eclipse. The same viewing rules apply – take precautions to preserve your eyesight while you enjoy nature’s show. As the eclipse sweeps across the nation, engage with others in your local community and across the country, posting your observations to the NASA app, sharing Space.com’s Twitter feed, and simply celebrating the unfolding miracle we are privileged to observe.